In some ways, a typical day growing up in Geneva was almost like taking a trip around the world. It is true that we didn’t get to see the famous sights, like cathedrals or water falls. We may not have experienced the noises and the smells that are such an interesting part of any great city. We didn’t have those things, but we did have something even more important. Every day in Geneva we saw people, and bears, from all over the world, living in Geneva for a few years, or visiting for a few days or weeks. Everyone knows about the people from all over the world in Geneva, but not many people know about the bears. During a typical day in Geneva we saw the best that the world has to offer. We became best friends with bears from many places. In fairness, I should add that we met some nice people too, but you probably aren’t surprised to hear that I liked the bears more. Geneva is a very international city. Would you believe there are over 200 international organizations in Geneva? There are large organizations that everyone has heard of, like the United Nations, the International Red Cross, UNICEF, the World Health Organization and the International Olympic Committee. There are technology organizations that hardly anyone has ever heard of, like the WMO and the ITU (that is why my traveling companion goes to Geneva). There are organizations to protect Human Rights, Children’s Rights, and Refugees. (Why isn’t there an organization for Bear’s Rights?) There is an International Peace Bureau, which sounds like a very good idea to me. There is even something called the “Pugwash Conferences”. I do not have any idea what that is, but you have to agree it sounds very unusual and impressive. All of these international organizations have people who work in Geneva, or visit for meetings. That is why we see so many people from around the world. If you look on the Internet, you can find information about all of these organizations. But there are other international organizations in Geneva too, and you will not find anything about these on the Internet. I’m talking about the international bear organizations. There are not quite as many international bear organizations as international people organizations, but there are still quite a few. One of the most famous, at least among bears, is the Aboriginal Bear Committee, also known as the ABC. This committee is responsible for protecting bears in their native countries, all around the world. I know a lot about the ABC because my dad is the head of security there. It is an important and interesting job that gives him the chance to meet many interesting bears. Every year, the ABC holds a large conference attended by famous bears from many countries. My dad gets to meet these bears, and sometimes he invites them home for dinner. We have had some extremely interesting guests over the years. Once we met a Panda Bear. Another year we met a famous bear from Yellowstone National Park. My favourite though, was the year my dad introduced us to a very famous bear from England, though I learned later that he was not born in England. He was born, and grew up, in deepest darkest Peru. I was interested in Peru, but I was even more interested in England, and he talked for hours about all the interesting things to see there. He said there were wonderful museums, art galleries, and famous buildings. Until then I had always thought there was no need to travel, because I was able to meet people, and bears, from all over the world without ever leaving Geneva. I wasn’t surprised when he told me about the interesting sights in other countries, but I was intrigued when he began talking about the unusual things that you could only get when you were in a country. This surprised me. I live in Switzerland, but I see cars made in France, Germany, America, and Japan. I can eat in an Italian or Chinese restaurant, or at least I could if I was a human. I can buy books from all over the world, and food from almost anywhere. I thought that I could get anything I wanted without ever leaving Geneva. He told me that was mostly true, but there were still some things that were only available in one country. There aren’t many things like this, but there are still a few. That is what makes it so interesting. You have to find the unusual things that people outside the country have never heard of. I thought about that for a while, and it made my head hurt. If people outside the country have never heard of something, how do they even know what to ask for? Our guest smiled and nodded. “That is exactly what makes it such an adventure” he said. I have always liked adventures, but I still wasn’t convinced. I asked if he could tell me about something from England that I’d never heard of. He thought for a moment and then gave me two examples. 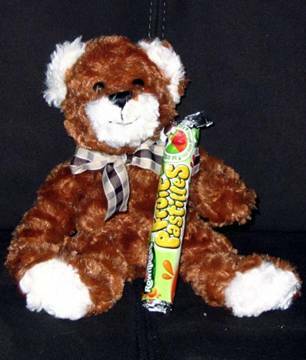 The first was a candy, called Rowntree’s Fruit Pastilles. I said that I’d never heard of them. Our guest laughed at that, and said that was exactly his point. The second example was even stranger. He asked me if I knew about something called “Nesquik” that you added to milk to make it taste better. I rolled my eyes, and said of course I did. 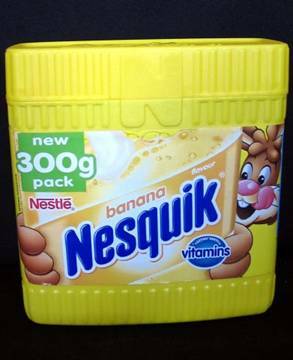 Then he got a twinkle in his eye, and asked me if I’d ever had Banana flavoured Nesquik? I looked at him in disbelief. Banana? Impossible! I know this is a strange story, but I had to tell you this so that you would know why I was so excited when my traveling companion told me that our next trip would be to England. I immediately asked him if we could go to a grocery store when we were there. He looked surprised, but said that we could if there was something I really wanted to get there. I smiled, and told him that I wanted Rowntree’s Fruit Pastilles, and Banana Nesquik. Imagine my surprise when he smiled knowingly, nodded, and said that he agreed they were both very good. How on earth did he know? We arrived in England on a Sunday morning, and had the afternoon free before my traveling companion had to go to his meetings. I asked if we could go for a walk. I think my traveling companion knew exactly what I was thinking, because he said that of course we could. When we went outside, I was very surprised to see sunshine. I had always been told that it rained all the time in England, but that certainly wasn’t the case while I was there. 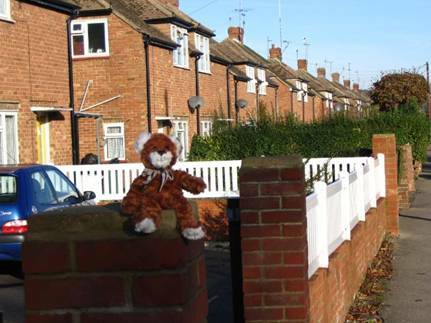 We had a glorious walk through a small English town, past rows of identical looking brick houses. My traveling companion told me that it was all very English. I wasn’t certain, but it did look much different than Canada, and even different than Geneva, so I guess he must have been right. I was surprised to see the cars driving on the left side of the road, just like in Japan. I had thought they did this in Japan because it was on the opposite side of the world from Canada. That sort of makes sense, doesn’t it? I thought that because England was between Switzerland and Canada, they would probably drive on the same side of the road. I was wrong of course. People are so confusing some times. At first I had to be very careful to look the right way when I crossed the street, but before long I was feeling quite comfortable. After we had been walking for a while, I casually asked my traveling companion if there was a grocery store anywhere nearby. He smiled and said that we were almost there. I was so excited that I gave him a big bear hug, being very careful not to hurt him with my claws. We turned the corner, and headed toward a store called Waitrose. I was confused, and asked my traveling companion where we were going. He said we were going to the grocery store. When he noticed my confused look he explained that one of the brands of grocery stores in England was Waitrose. I had never heard of it. I think it would be much easier if people used the same names for grocery stores everywhere. Of course people never ask for my advice about these things, so I suppose we will continue to have different names for grocery stores in every country. I guess it is all part of the adventure. As soon as we went into Waitrose, I knew my traveling companion was right. It was definitely a grocery store. He even let me ride in the grocery cart while we were shopping. It took us a little while to find what we were looking for, but when we did we picked up several rolls of Fruit Pastilles and containers of Banana Nesquik. I was so excited I could hardly sit still. The rest of the week was fairly uneventful. During the day my traveling companion went to boring meetings, while I stayed in the room watching English TV and eating Fruit Pastilles. I was surprised to learn there are only 5 TV channels in England. Of course, it doesn’t really matter that much. Even with 100 channels there are hardly ever any shows that bears really like. I didn’t complain though, because I had finally been able to visit England and find the unusual things I had been looking forward to trying. When the week was over it was back to Canada to see my friends in grade three again. I wonder where my next adventure will be.